The vision for Te Kura Kaupapa Maori o Ngati Kahungunu o Te Wairoa was to create a fresh new centre of modern learning that looks to the future, while maintaining strong links with the past and encourages close ties with the community while reflecting Wairoa’s unique culture, history and landscape. Kura Kaupapa Maori are Maori-language immersion schools (kura) where the philosophy and practice reflect Maori cultural values with the aim of revitalising Maori language, knowledge and culture. The new building was planned and orientated along critical ley lines, which are significant to the local community. The central plan which consists of a multipurpose hall (the heart) faces directly north, and to the south is the Wairoa river mouth. The eastern wing houses the senior students, library, and workshop, and is orientated towards the local culturally significant mountain – Whakapunake. 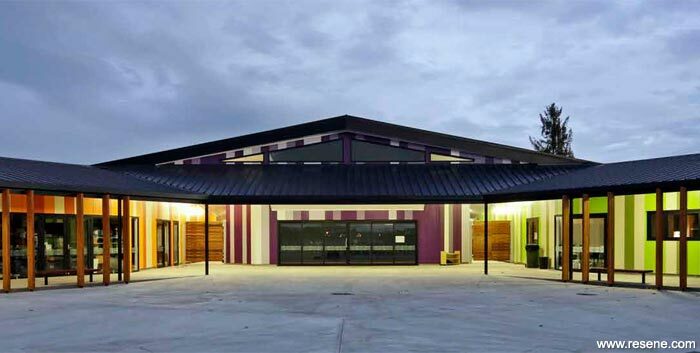 The western wing contains the administration and staff area, junior students, and kitchen facilities, this wing is orientated towards the local Marae (Maori meeting house) – Takitimu Wharenui. The central hall and two wings are connected by one roof form which resembles a ‘cloak’ acting as shelter; under one cloak – under one roof. 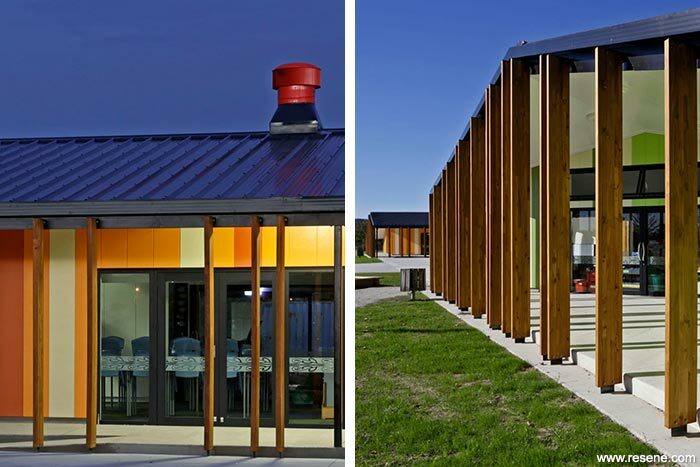 The building has been designed as a total sustainable solution from its orientation to the northern solar gain to passive ventilation, natural daylighting, rain water harvesting, and solar panels. 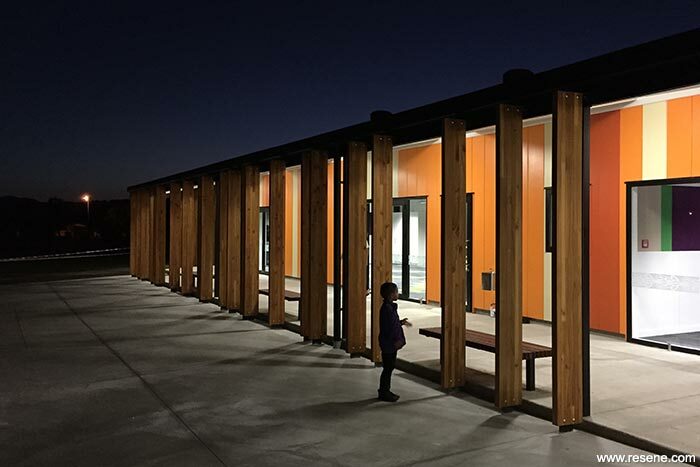 Extensive overhangs provide shaded outdoor teaching spaces defined by a perimeter of timber fins referencing the edge of the ancient forest that the Maori respected for shelter, food and building materials. These fins define the edge of the sheltering wings of the building and facilitate teaching and socialising spaces for work and play. The traditional and aging style of teaching has been replaced with new modern facilities, allowing 50-60 pupils per classroom in open plan learning spaces with a variety of well-connected learning spaces through the use of new building materials and technologies. 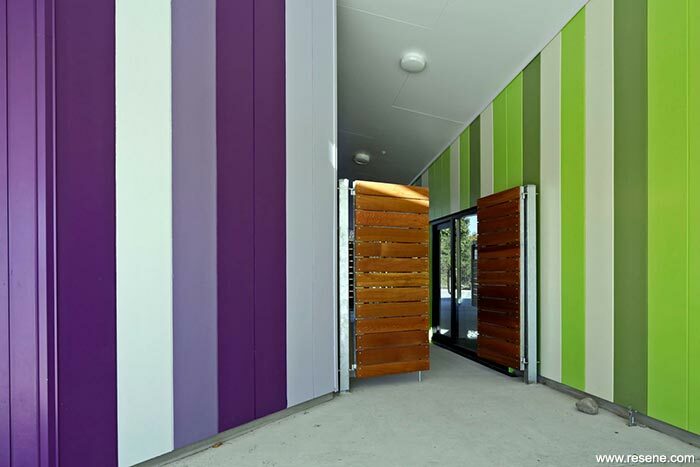 The vertically installed cladding panels are painted in different colours to represent various significant aspects of the Kura and Community. The different shades of purple – Resene Sonyx 101 semi-gloss waterborne paint in Resene Abbey Road (orchid rose), Resene High Society (softened purple), Resene Grapevine (blackberry), along with Resene Black – are used on the hall which is the ‘heart’ of the Kura and represent the school colour. Shades of green – Resene Atlantis (yellowed green), Resene Koru (verde green), Resene First Light (lemon sherbet) – are used for the Junior school to reference the forest. 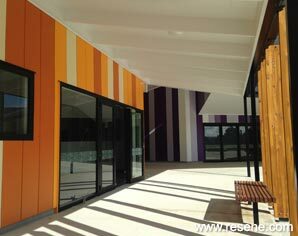 Shades of orange – Resene Sidecar (yellow green oxide), Resene California (bold orange), Resene Clockwork Orange (bold orange), Resene Porcelain (delicate white) – are used for the Whare Kura (Senior school) to reference the sunrise. The sun represents accomplishment – rising from darkness to light. It is always challenging on school projects to create cutting edge architecture with limited budgets, and certain restrictions. On this project the colour scheme was used to make the project sing and there have been numerous comments from visitors and from community members on how striking the colours are. 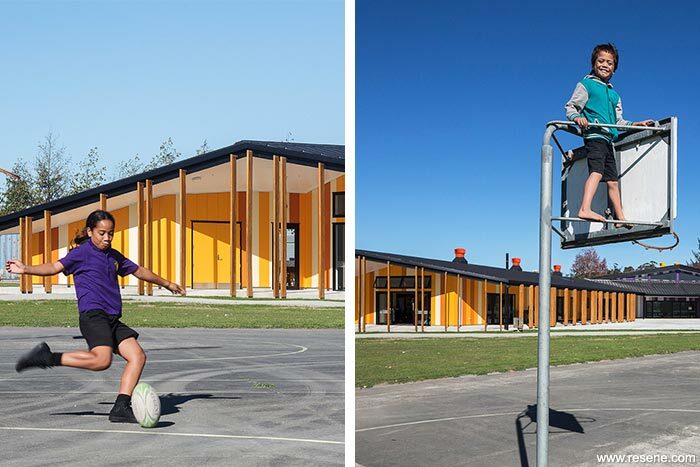 Te Kura Kaupapa Maori o Ngati Kahungunu o Te Wairoa by RTA Studio won the Resene Total Colour Education Colour Maestro Award 2016. The judges thought: “Colour is used to wonderful effect. The colour development process engaged the local community. This has brought a sense of belonging, connection and pride that shines through the colour selections. The colours aren’t the normal primary colours that you see on many schools, but tend towards dustier and more complex tonal contrasts. The colours are applied in vertical bands, with palettes of related colours that have a sense of movement and rhythm that wouldn’t have been achieved with large blocks of colour. The colours draw you in and give each part of this school its own personality.